I am called upon, from time to time, to offer blessings in a new home, or to bless a newly purchased item. I love and welcome these opportunities to perform rituals that shift energy toward a specific outcome. Here, I will share two rituals, one which clears and purifies second-hand or pre-handled items. The second ritual is for blessing a new home. This double-whammy approach will enliven your living space with good energy and set the stage for restful sleep, good health, peace, harmony, and lots of love and good times. The element of fire is used by nearly every religious group in ceremonies all over the world. Fire invigorates, purifies, cleanses and transforms energy. Candle magick involves the use of fire and candles, combined with setting intentions toward a specific outcome. The more specific your request, the better your results. In general, energy work (including candle magick) should be practiced with an intent to "do no harm." Willful interference in the personal energy flow of another should only be done with their permission or, as in the case of infants or people who are mentally incapacitated (in a coma, Dementia, severe mental retardation, etc. ), with the permission of a legal guardian. Put cedar chips in fire safe container and light them. When the smoke begins to rise, add the herbs (sage, rosemary, thyme). 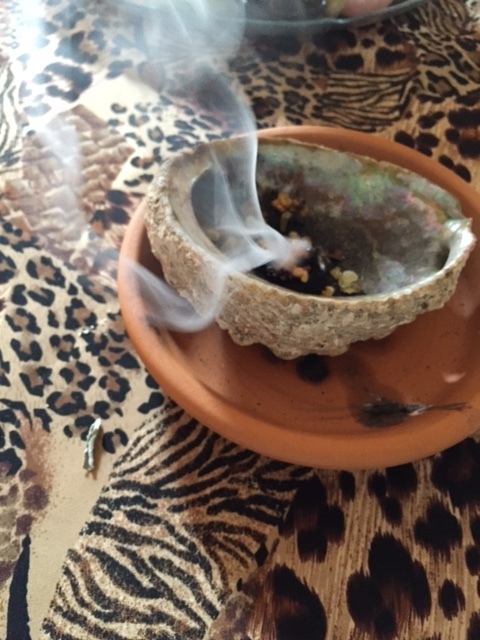 When a good bit of smoke is wafting, pass the item through it and say: "rosemary, sage, and thyme, remove any evil which may dwell within. Cedar, clear this (name the item) and make it new. Smoke, wash away the past. As I will it, so let it be." If your item is too big to pass through the smoke, walk in circles around the item, using your hand to guide the smoke toward it. Leave the burning items to extinguish on their own. Perform this ritual on the first night after moving into a new house or apartment. Stand in the center of the home and light the white candle. Pass the cinnamon stick through the flame several times, until you can smell the fragrance of the cinnamon. Save the cinnamon stick for further use. Add hot water to the spray bottle with 7 drops of sage while saying: "sage of cleansing purity, bless my home. It will be a place I love merrily. It will be a place I live happily. Sage of cleansing purity banish sickness, fear, and keep loneliness at bay. In this house, I will welcome true friends." Walk through every room of the house repeating these words and spritzing each area three times. Don't forget to include closets. Using the same cinnamon stick, simmer it every night for 7 nights, allowing the scent to permeate the home. Discard the cinnamon stick in the front yard after use.